KATHMANDU, Dec 28: As formal and informal negotiations continue between the CPN-UML and CPN (Maoist Center) for party unification and formation of the new government, management of second-rung leaders of both the parties has emerged as a major challenge. Party insiders within the UML and Maoist Center say that the party's second-rung leaders have been exerting pressure on their top leaders to secure dignified position before they could decide to unite the two parties. This issue has not only deferred party unification process but also caused some delay in the formation of the new government. Senior leaders of UML as well as Maoist Center, who are expected to lead their respective parties in the future, are cautious of their position in the united party. Some of the senior leaders are even making controversial remarks that could possibly vitiate the environment of unity. UML Secretary Pradip Gyawali admitted they have some challenges in managing the senior leaders in the united party. "But, I don't think this issue will hinder the unification process. Even if there are some issues about it, the top leadership of both the parties has to take some risks to go for unity," he said. The two parties have formed party unification coordination committee comprising of eight members including the party chief from each party. 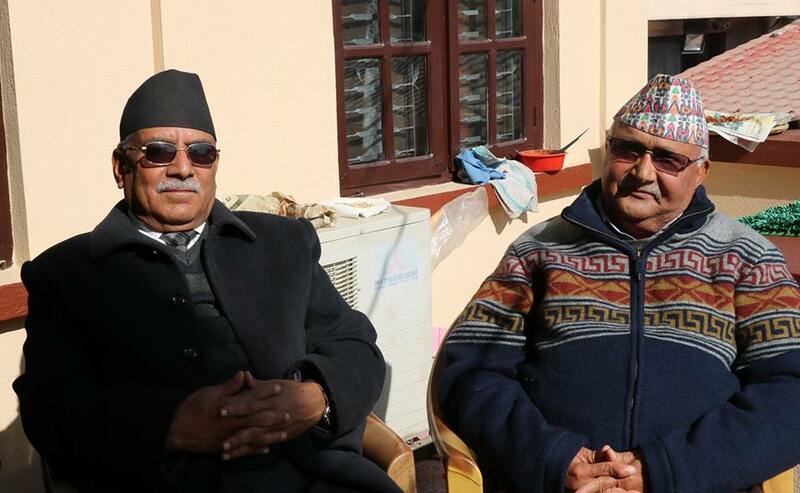 Sources said there has been an understanding between UML Chairman K P Oli and Maoist Center Chairman Pushpa Kamal Dahal to first come out with a tentative modality and criteria for the unification of their respective parties. The unification coordination committee, which shall convene by Friday, will then hold detailed discussions on the proposal to expedite unification process, according to leaders. Sources said the issue of leadership management figured prominently even during one-and-a-half-hour meeting held between Dahal and Oli at the latter's residence on Wednesday. As uncertainty looms large on the party's unification process, the leaders said that the meeting was aimed at clearing the speculations that the unification between the two parties was not taking place. "Although the actual unification of the party may take place only in March, everything is well on track right now. The party unification coordination committee meeting that is likely to take place on Thursday or Friday will expedite further negotiation on the party unification," Gyawali said. The two leaders also held discussions on the formation of the new government and resolving the disputes surrounding the ordinance related to National Assembly formation. "We have also decided to ask the Election Commission to release the poll results early. We have got an impression from the remarks of the prime minister that he is not ready for a smooth transition of power to the elected parties," Gyawali further said.